Watching the events that have unfolded in Egypt over the past week and then reading and listening to eyewitness accounts of what has gone on a few things strike me personally that I wanted to enumerate. 1) Mubarak is no different from most of the Old Men of Africa/Middle East – no better, but no worse. Hosni Mubarak has been in power for 30 years, he has done things which would not have been accepted in “open” democratic nations. The corruption of many in government; the stifling of political opposition, the “virtual police state” are not to be lauded ever. One of the leaders at IHOP was detained for over 18 hours and finally not allowed in to Egypt last summer simply for his Christian message. These things are not good. 2) Democracy is an alien concept to many nations including most of the Middle East. While the stated Foreign Policy of the US has been to promote democracy in every nation, in many nations this is simply too foreign to institute over night or even over a generation. This has been evidenced in Russia in the past 20 years. While the protests in Cairo began with peaceful Egyptians expressing their frustration at the current regime, it appears that these protests in Tahrir Square, the epicenter of this movement (and also interestingly where the House of Prayer is located in Cairo) have transitioned from a popular movement to a highly organized political grab for power. The general population have by and large accepted the replacement of the government and the appointment of Omar Suleiman, while looking towards a transition of power within the next six months. However in the square it appears many of the protestors are “plants” with exactly the same blankets, cell phones, and with strange dialects ie not locals. This would point towards a more organized grab for power by the Muslim Brotherhood who have everything to gain from Mubarak leaving office in the midst of protest and confusion and everything to lose with a more drawn out and orderly transition. It must be noted that revolutions and mob rule have never been the same as a democratic process, they are simply the actions of bullies. 3) What happened in Tunisia was a catalyzing spark for the whole of the Middle East, but what happens in Egypt is critical for the future direction of the whole of the Middle East. Egypt is the leading Arabic nation, it has the largest military, has the largest funding (over $1billion pa) by the US (obviously these two facts are related) and arguably has the biggest influence on Arabic culture in the Middle East. Whoever eventually takes power over the next year will have an immense impact on the nation and therefore on the whole of the Middle East. Egypt’s peace with Israel has meant that the Middle East has been fairly stable for the past 25 years. (An Israeli may disagree with me on this point as they have been battling the Palestinian Intifada and their incursion into Lebanon), but war with Egypt is an entirely different proposition, especially with an unstable Iran who would love to join any party with an aim to “wipe Israel off the map”. An unstable Middle East is prophesied, but despite this we need to continue to pray for the peace of Jerusalem, as an unstable Middle East is not a good proposition. 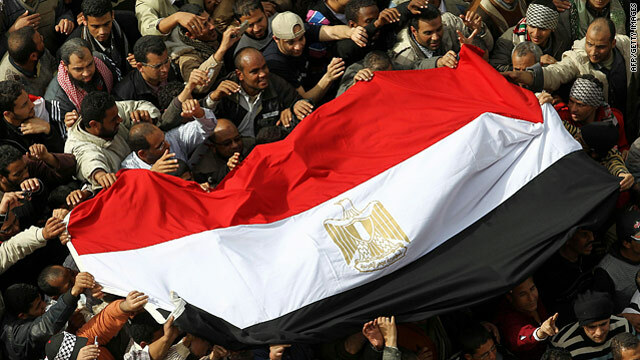 1) Pray that the Lord would raise up a leader in Egypt, that the political grabs for power by men would be thwarted. Pray for Hosni Mubarak, Omar Sulieman and all those in power that they would encounter the Lord. 2) Pray for the House of Prayer and the believers in the Land of Egypt that they would be strengthened with might and the power of the Holy Spirit at this time. That in this time of uncertainty many would come to a saving knowledge of Jesus. 3) Pray for Safety of believers in Egypt. 4) Pray for the Peace of Jerusalem – that the unfolding events would not bring warfare to Israel, but peace and a reconciliation between Ishmael and Isaac. This entry was posted in In the News and tagged Egypt. Bookmark the permalink. Great post – I'm prayingBut pity about the post before – it has widely been discredited. I'm in Cairo right now, and have shown it to 3 Egyptian Christians who aren't sure whether to laugh or cry that such things are circulated.I got the email in my own inbox, and reported it as Spam – the best it deserves. The email post before was sent by friends in Israel from a "national-level prayer leader in Egypt whom we highly respect". I do not know Rafik personally – I am trying to ascertain how closely my friends know the source of the email. I do not believe as may have been intimated (or exaggerated) that a million people protested peacefully in support of Mubarak. I'm pretty sure that would have been picked up by the news media regardless of any agendas. I do think that many Christians do not trust the agenda of many who are protesting. Pray for the House of Prayer and the believers in the Land of Egypt that they would be strengthened with might and the power of the Holy Spirit at this time. That in this time of uncertainty many would come to a saving knowledge of Jesus. * this is my heart and focus in prayer.. to pray for the christians there and the empowerment of God's will in the midst of the uprisings. It sure is end times isn't it.